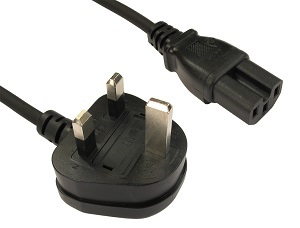 2m IEC C15 Power Cable, UK 3 pin plug to IEC C15 3 pin plug (kettle style). The C15 connector, although similar in appearance to the C13 has a higher temperature rating of 170 degrees rather than 70 degrees and is sometimes called a hot connector. You can tell the difference between a C13 and a C15 connector by the notch in the connector; this means a C15 plug will work with a C14 and a C16 socket. A C13 plug however will only work in a C14 socket. 1.8m cloverleaf power cable C5, UK 3 pin plug to C5 cloverleaf mains lead. Voltage rating 240V AC. Cable type, 3 Core. Colour black. Length 1.8m. The C5 cloverleaf connector is a 3 pin plug often found on devices such as laptop power supplies. 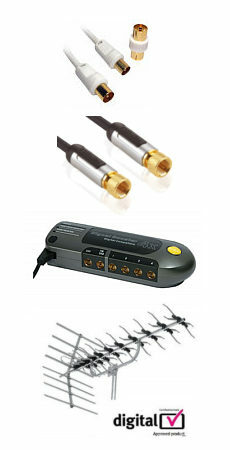 5m IEC Power Lead, UK 3 pin plug to IEC 3 pin plug (kettle style). Voltage rating 240V AC. Cable type, 3 Core. Colour black. Length 5m. Current rating 10A.